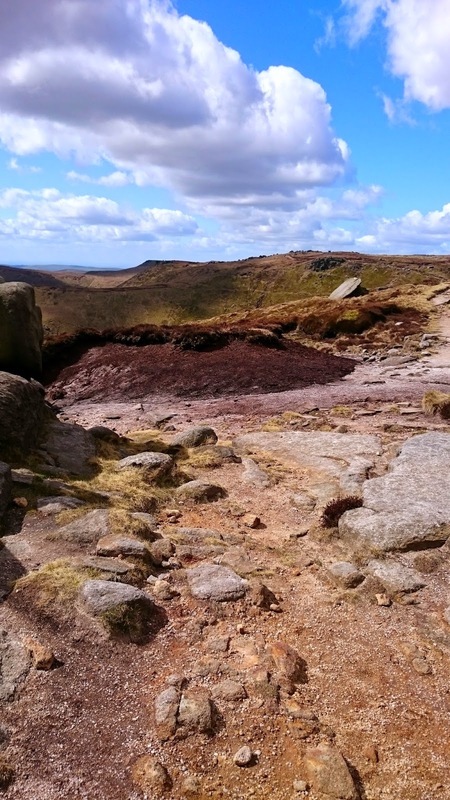 Travels in a Campervan: Fancy a little walk in the Peak District......? 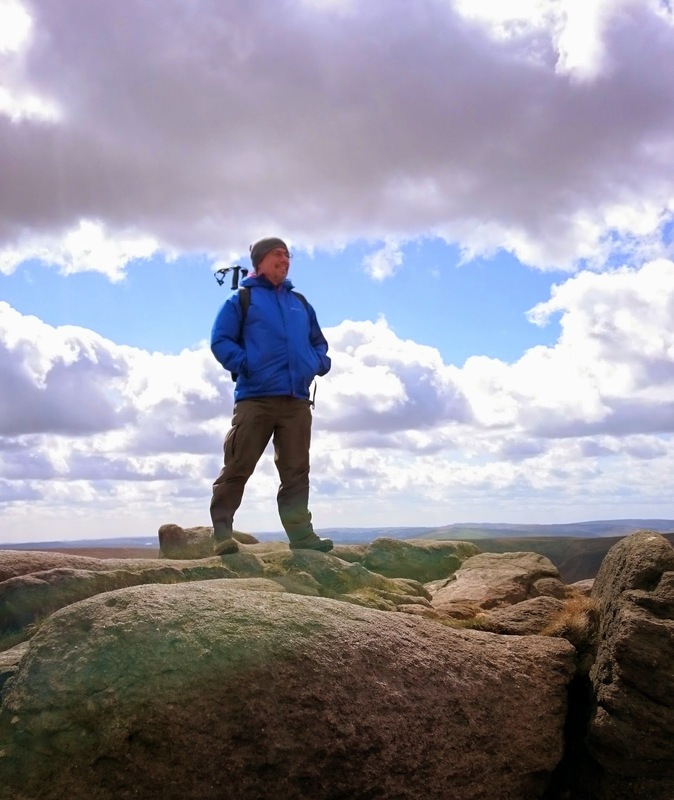 Fancy a little walk in the Peak District......? Another weekend without our campervan! Those who know us will be aware of the saga. I can't provide further details due to impending court cases, but suffice to say we should've had this van at least 12 months ago. 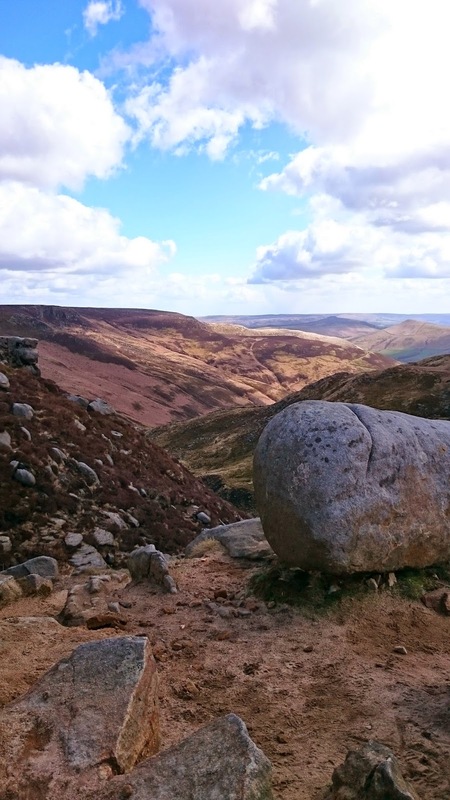 So we decided to take ourselves off to the Peak District for a bit of a stomp in the fresh air and to take our minds of the frustration of still not having our van. Cathy had recently bought a booked called "Pathways - journeys along Britain's historic byways, from pilgrimage routes to smugglers' trails". 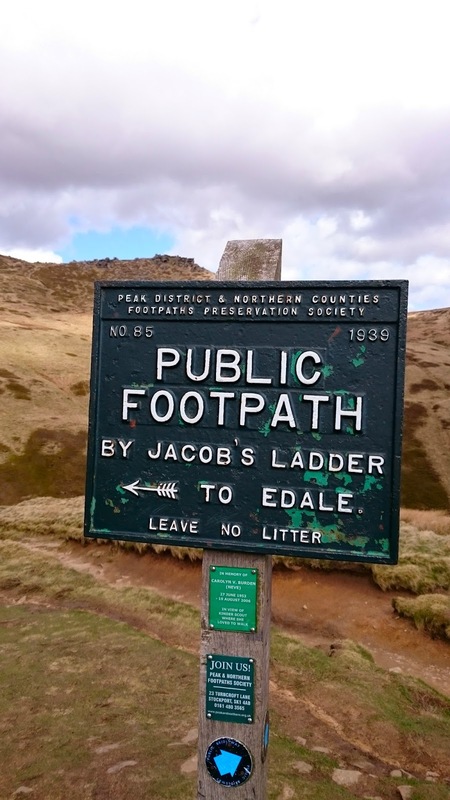 There was one particular packhorse route, starting in the village of Edale and climbing up through a valley to the top of the moors to visit Jacob's Ladder, which looked about the right distance......looks can be deceptive! Sandwiches and flask made and rucksacks packed, we left home at about 0930 and had a steady drive to the car park on the edge of Edale village, arriving about an hour later. Our route was taking us on a circular walk in an anti-clockwise direction. It was a breezy and cool day but the sun was due to shine and we started off with coats packed away. 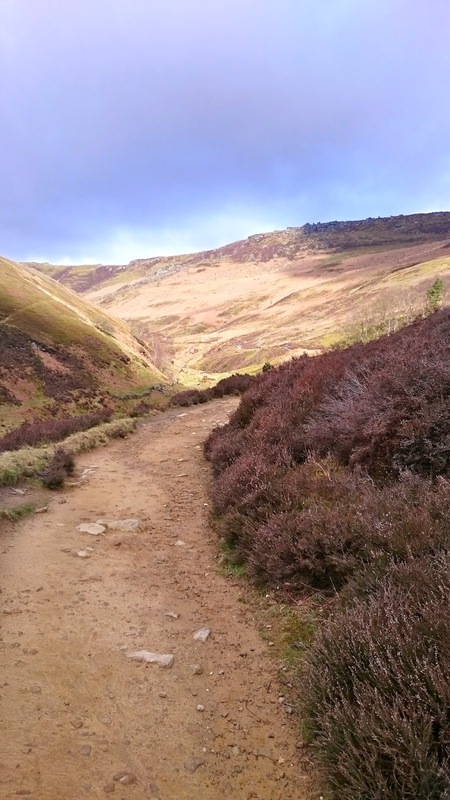 The walk took us through the village and out onto the footpath heading up and through a valley known as Grind's Brook. This started off as a limestone path with the brook down to our left. 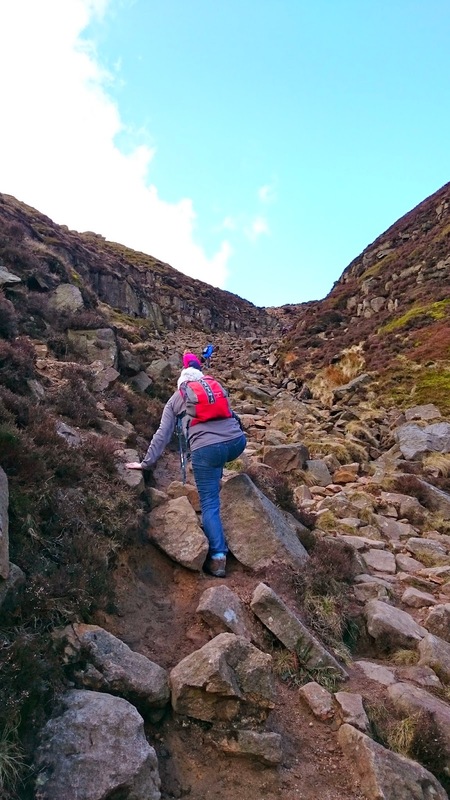 But it soon became a very steep clamber over large loose boulders. Had we strayed from the path? Nope, there were plenty of people ahead of and above us climbing to the top. This was certainly unexpected and Cathy was feeling the pace. But we had a few water and breathing stops on the way and finally made it to the top. 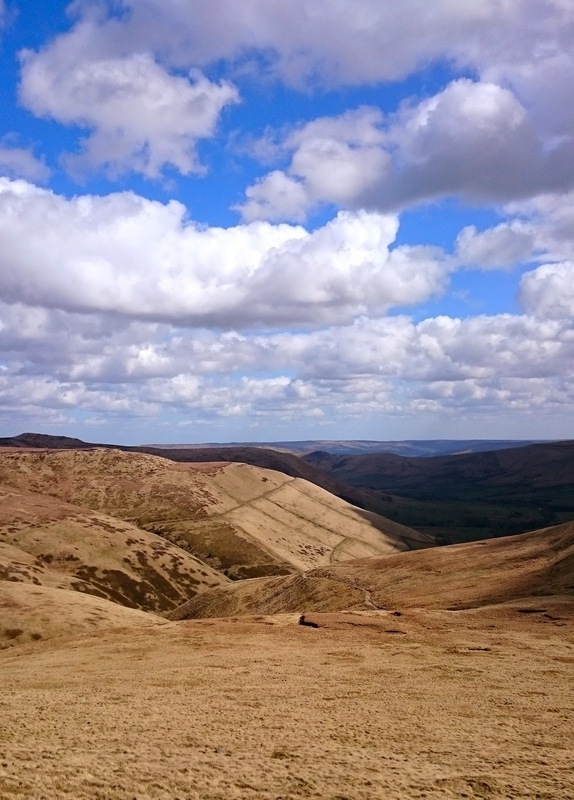 It was cold and very windy up there, so we found some shelter and had our lunch (tuna mayo butties - our walking staple) with a cup of hot tea, plus a shared granola flapjack that we had bought in the small shop in Edale. then....blimey do we need to go up there! "I don't remember signing up to this" said Cathy! 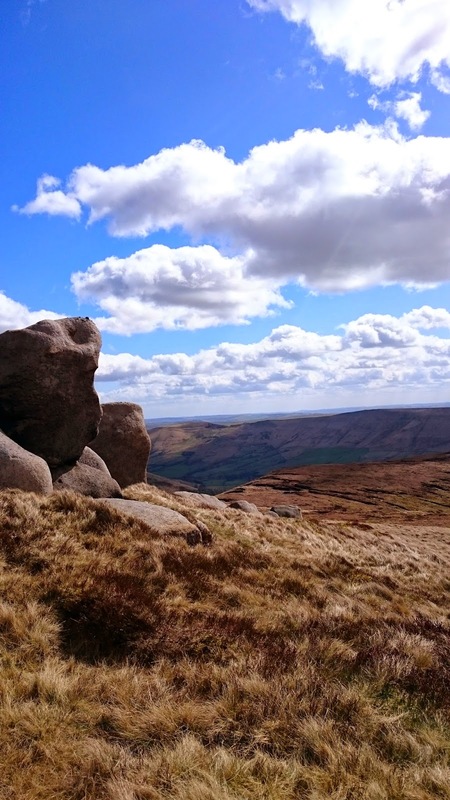 Suitably refreshed and having taken in the great views, we followed the path west, heading towards Crowden Tower, the first of a series of large, very impressive gritstone outcrops, carved into all sorts of strange shapes by the erosion power of the wind and rain. 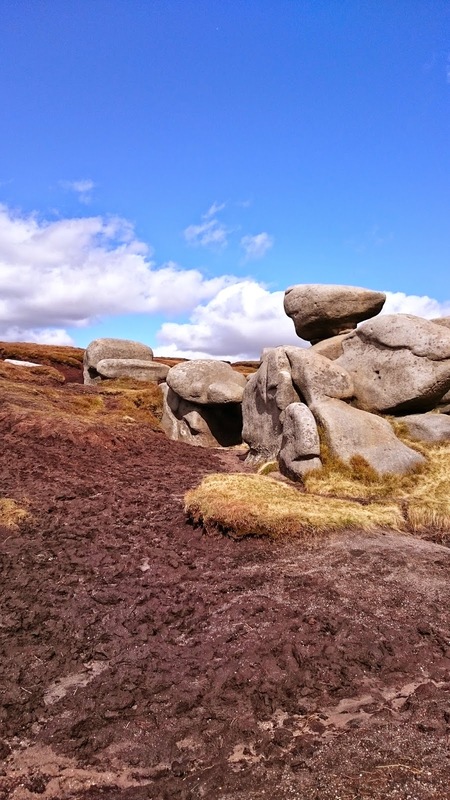 We enjoyed exploring these before heading off on the path again. 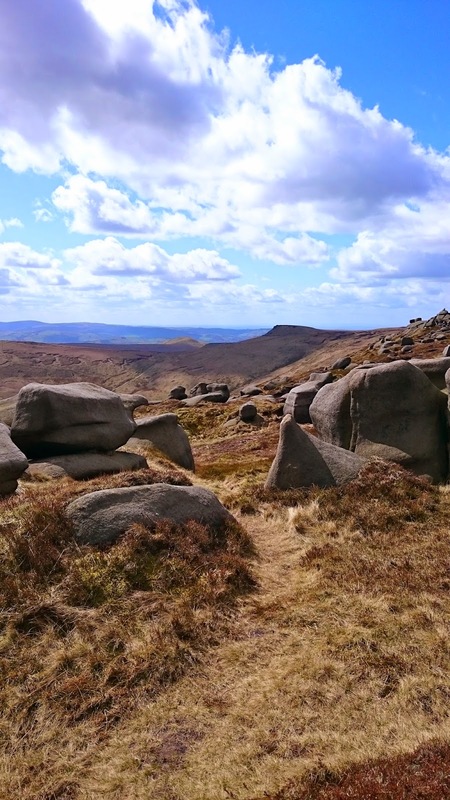 To the north we could see Kinder Scout, scene of the mass 1932 trespass to campaign for the right of public access to the moorland - thanks guys! We followed the path along the top of the ridge - man it was cold despite the sunshine. 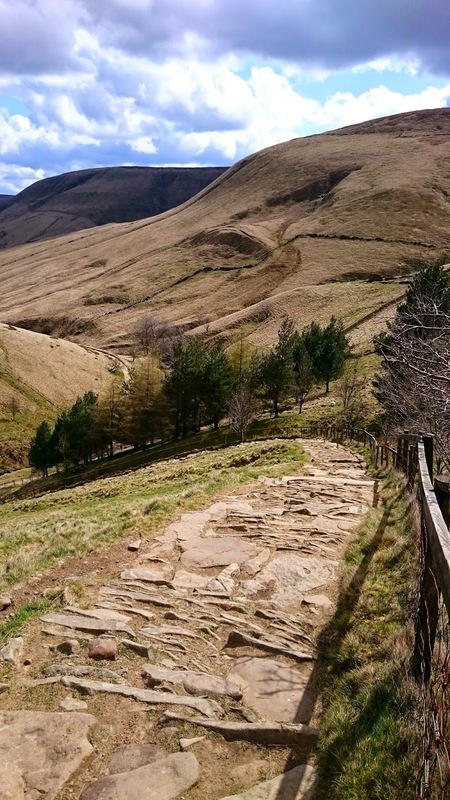 The path swung to the top of Jacob's Ladder, a large, steep stone pathway that's part of the Pennine Way, where it joins the packhorse route running from Hayfield to Edale. 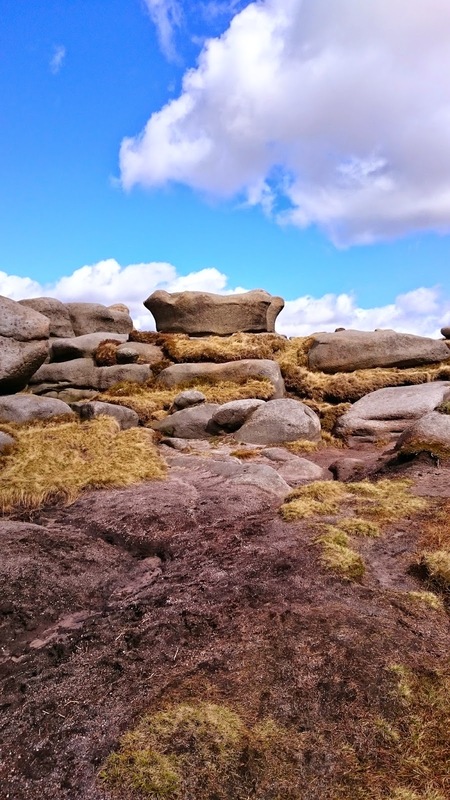 We stopped in the shelter of a large mound and stone outcrop and had another brew and shared the second flapjack bar, before descending Jacob's Ladder through another valley. This gave us very wobbly legs! Down at the bottom we were starting to flag and on approaching a farm at Upper Booth Cathy said she really fancied some tea and cake. Within a few seconds we saw a gate and a sign for 'tea and homemade cakes'! Cathy had hot chocolate and lemon drizzle cake and I had tea and date & walnut cake - highly recommended. 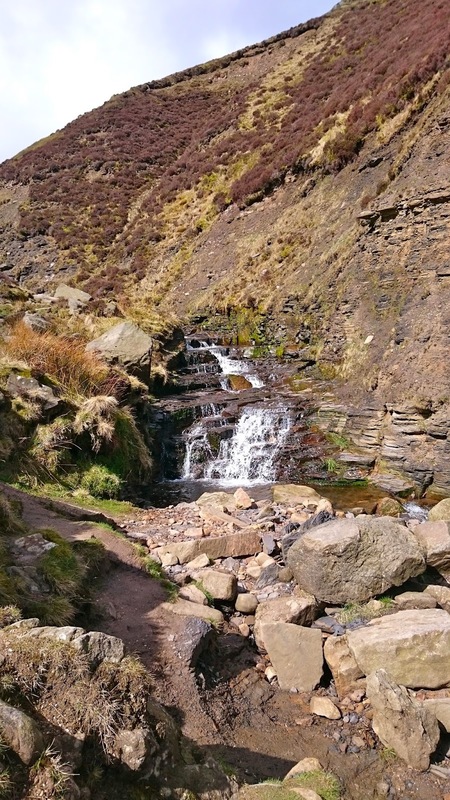 We decided not to follow the Pennine Way back to Edale but instead took the road - perhaps not a great idea as it was longer but we'll remember that next time. Back at the car we flopped into the seats for the drive home for a hot shower, change of clothes, and some well-earned alcohol! I cooked beef in black-bean sauce with stir-fried vegetables which went down very well. We really enjoyed the walk. It's fair to say we're not 'walking fit' so we do need to get out more and plan to do this when our campervan's eventually ready!